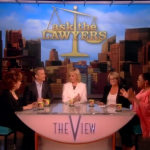 Dan Abrams on "The View"
Yesterday, Dan appeared on The View, alongside Jamie Colby and Judge Mary Ann Gunn, to discuss the George Zimmerman Case, Amanda Bynes, and Michael Jackson. George Zimmerman has been charged with the murder of Trayvon Martin, with the latest updates being that Judge Nelson denied the defense team’s request to be able to mention Trayvon Martin’s marijuana use, his school suspensions, and text messages during the opening statements. Dan’s speculates, “In my view, O’Mara wanted to get this out there. He’s figuring that there has been so much negative stuff about my client that I have a right to – sort of, he wouldn’t use this word – but to poison people out there. He knew that he wouldn’t get past marijuana use. The key is what happened in those moments. What happened in those six minutes leading up to it. That’s the key question.” Watch the episode here.